Bury Church Fete is back! Saturday, July 29 sees the return of Bury Church Fete. Spokeswoman Karen Davis said: "This highly popular village fete, set at the foot of the picturesque South Downs and overlooking the river Arun has been a long-standing summer favourite with locals and visitors for many years. For 2017, the organisers have added in more child-friendly events and some great opportunities for adults to grab a bargain. "Located in the beautiful surroundings of Dorset House School the fete has been well known in the past for its traditional stands including the tombola, fashion boutique, cakes, plants and pictures. 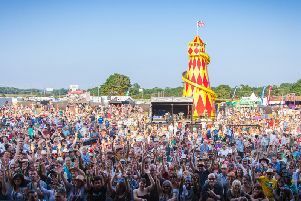 For 2017, new additions include the ABC Animal Sanctuary from West Chiltington who will be bringing their adorable goat Homer to meet visitors, a Fire Engine from West Sussex Fire and Rescue, Petworth Town Band, The Alternatives music group who will be entertaining in the amphitheatre and a traditional puppet show for all to enjoy. "Father Peter, the new incumbent vicar of the Parish will be both cooking up chips for visitors at £1 a pop and drawing the raffle, where the top prize is £200 and runners up receive cash or prizes including tea at Amberley Castle and supper at the Squire and Horse pub and Bridge Inn." Organiser Carol Shillingford said: "We are thrilled that so many people come to the Bury Church Fete which actually supports four churches in this Parish including Hardham, Coldwaltham and Houghton as well as St John’s in Bury. We’ve kept the successful inflatable slide, ice cream stand, Splat-The-Rat, coconut shy and toddler area from last year which we very much hope will add to a wonderful day out for all the family." · Prize Raffle draw with a top prize of £200 and many others. Bury Church Fete is held at Dorset House School, off the A29 at Bury on Saturday 29th July 2017, Gate opens at 1pm for Barbeque and 2pm for the fete stalls, Entry £2 for adults including programme and free for children.